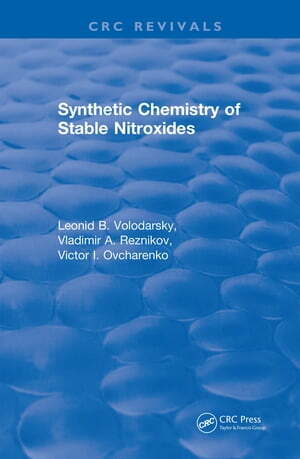 Collins Booksellers - Synthetic Chemistry of Stable Nitroxides by L. B. Volodarsky, V.A. Reznikov & V.I. Ovcharenko, 9781351357418. Buy this book online. This important book is devoted to covering the synthetic aspects of nitroxide chemistry. The problems of application and physicochemical properties of nitroxides are considered in the context of the choice of necessary radical structures, convenient precursors, and strategy of the synthesis. The book offers comparisons of the concrete classes of nitroxides to help reveal the structural peculiarities and synthetic abilities of compounds of different classes. It also summarizes data on the magneto-structural correlation for the metal complexes with 3-imidazoline nitroxides and considers the ways in which the molecular design of 2- and 3-dimensional heterospin compounds is capable of magnetic phase transfer in a ferromagnetic state. The book will be a significant reference for chemists, biochemists, spectroscopists, and other users of nitroxides, spin labels, probes, and paramagnetic ligands.